Took place in the modern-day cities Whittier, Pico Rivera, and Montebello, CA about ten miles south of downtown Los Angeles. Sketch of the Passage of the Rio San Gabriel, Upper California, by the Americans, - discomfiting the opposing Mex. Forces, Jan. 8th 1847. 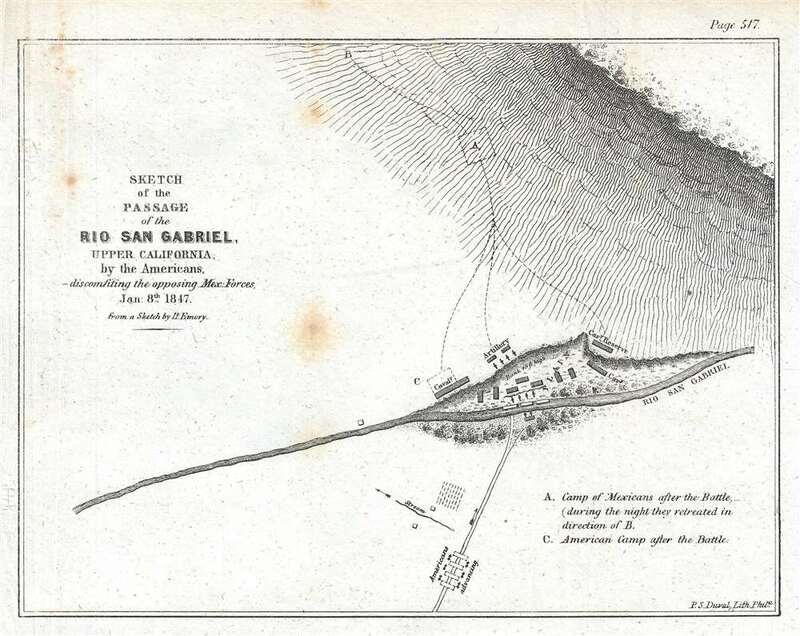 This is an 1847 William Hemsley Emory map of the Battle of Rio San Gabriel during the Mexican-American War, which took place in parts of modern-day Whittier, Pico Rivera, and Montebello, California, about ten miles south of downtown Los Angeles. The Rio San Gabriel (San Gabriel River) bisects the map and was the focus of this engagement between the American force led by Commodore Robert Stockton and the Californian contingent under the command of José María Flores. The American force had set out from San Diego on December 29th, with the goal of reaching a besieged American force in Los Angeles. On January 8th, at two-thirty in the afternoon after marching eleven- and one-half miles, Stockton and his men reached the Rio San Gabriel. As the American approached the river, they formed into a square, believing this to be the most effective defense against a mounted enemy. An advance group from the Californian force began harassing them even trying (unsuccessfully) to drive a group of wild mares into the Americans. The Mexican artillery occupied the high ground on the far side of the river, which did not provide the best fire for the Mexicans, even though they held the high ground. The Americans successfully forded the river and brought their own artillery to bear against the Mexicans, who, faced with superior firepower, withdrew to the north, closer to Los Angeles. This map was engraved by Peter Duval from a sketch drawn by William Hemsley Emory and published in 1847. Though fairly well represented in institutional collections, this map rarely appears on the private market. William Hemsley Emory (September 7, 1811 - December 1, 1887) was an American surveyor, civil engineer, and Army officer. Born in Queen Anne's County, Maryland, Emory graduated from the United States Military Academy at West Point in 1831, was assigned to the Fourth Artillery, and resigned from service in 1836 to pursue civil engineering. He returned to the army in 1838 to serve in the newly-formed Army Corps of Topographical Engineers. During the Mexican-American War, Emory served in the Army of the West under the command command of Stephen Watts Kearny. While serving with Kearny, he kept a detailed journal that was then published as Notes of a Military Reconnaissance from Fort Leavenworth to San Diego and soon became an important guidebook for the route to Southern California. After the war, Emory served as part of the team that surveyed the United States-Mexican border. When the American Civil War started, Emory was stationed in Indian Territory and immediately realized the likelihood that Confederates would capture him and his men. To avoid this, Emory quickly secured the services of Black Beaver, the famous Lenape warrior, to guide them out of the territory. Emory and his troops, on their way from Fort Washita to Fort Leavenworth, captured a number of their Confederate pursuers, which were the first prisoners taken during the war. Emory then served in the Army of the Potomac, in the Western Theater, and in the Shenandoah Valley Campaign of 1854. After the war, Emory held the post of commander of the Department of the Gulf during Reconstruction and, in September 1874, President Ulysses S. Grant ordered Emory to New Orleans, where he successfully negotiated a peace with the white supremacist paramilitary organization the White League, which led to the White League being disbanded. Emory married Matilda Wilkins Bache on May 29, 1838 in Philadelphia, with whom he had two sons, both of which served in the United States armed forces. Peter Stephen Duval (1804/5 - 1886) was a prominent Philadelphia lithographer. He immigrated to Philadelphia from France in 1831 to take a job as a lithographer at the Philadelphia firm owned by Cephas Childs. In 1837, Childs retired and Duval took over the business. Over the course of the next thirty years, Duval would have several business partners and in 1857 his son Steven C. Duval joined the business. Peter Duval retired in 1869 but continued to be involved in his company until his death in 1886. Very good. Even overall toning. Foxing. Blank on verso.